These shocks are designed to bolt up directly to the models listed on our compatibility chart. Overall length eye to eye: 352mm (13.87"), bushing I.D.10mm (0.393"); bushing width 23mm (0.90"); gloss black shock body with chrome inner shroud; spring rate 110 lbs. Have a Question about AJS BSA Matchless Triumph Shrouded Shock Set ? Can use this shock 352mm eye to eye for my Norton model 50? Unfortunately we do not have the specs for the model 50. I suggest you measure your shock eye-to-eye and compare it to the measurements for this shock. 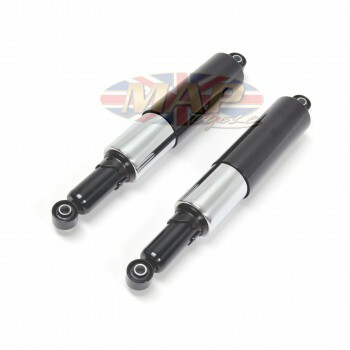 The manufacturer does not specify that this shock will fit any Norton model, however, as long as the measurements are the same, it should work.